What do I want most for my daughter Elsa? Oh my. So many, many things. I want her to be able to express herself in a way that others can understand. I want her to have mobility and touch the things that pique her interest. I want her to find joy in her world and access environments with ease. I want her to grow and flourish and shine. I want her to know that she is loved more than she could ever know. And I want her to have friends. Not “friends.” Friends. The kind that want to play with her, talk with her, go places with her. Be with her. Communication. Without a degree in speech therapy, or a parent or sibling’s immersion experience, the chasm between Elsa and a potential friend is hard to traverse. But it’s not impossible. There is a way across the divide. And the first step toward bridging the distance is an olive branch. A heart-felt attempt. A play date. 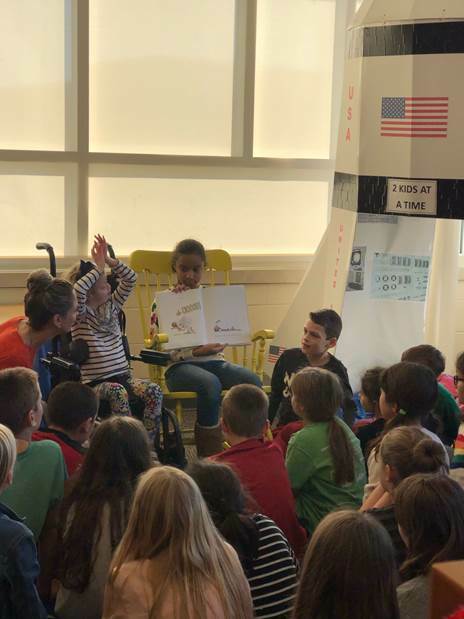 That’s exactly what we got when we visited a local school this week to participate in something called The Nora Project – a program that helps foster friendship, empathy and understanding between children with special needs and typical peers. For years, my sister Betsy has listened to me speak out and (truth be told) cry out my inner-most desire for Elsa - to be known, understood and embraced by her peers. And, because she has a heart the size of Chicago, Betsy found a way to help make this dream come true. 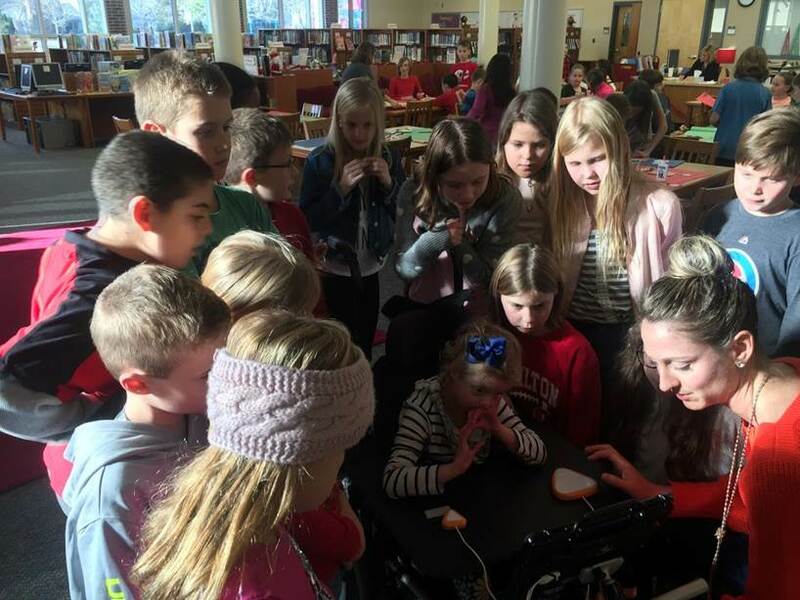 After seeing a segment on The Nora Project on a local news station, Betsy reached out to our neighborhood school to see if they might be open to exploring The Nora Project. (Pssst, THIS is the power of diversity in media coverage. THIS is why it’s SO necessary.) Thankfully, the school said YES! But that was it! Before we knew it, the date of our first visit had arrived. Your pants are so cute. What is Elsa’s favorite color? Does she have siblings, and do they have the same diagnosis? A student read Elsa a book, allowing her to touch the pictures - as she LOVES to do. 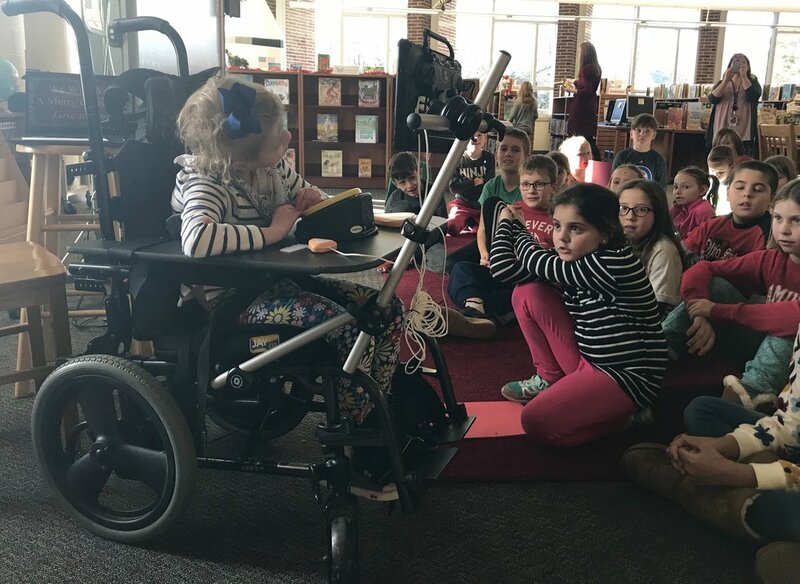 Another student asked if she could push Elsa’s wheelchair, learning where the brakes were and how the tilt safety works. Then they all gathered around her chair as she shared how her talker device works. OMG, Elsa was such a show off. She said MORE over and over, as more and more of her new Nora friends gathered around her. She navigated to HELLO, all by herself. She told silly jokes and things about herself, like her town, number of siblings, and birthday. Plain and simple, she thrived under the pressure and the attention. I’ve never seen her so focused and accurate with the talker. It was amazing. The visit was like a slice of heaven. I told the kiddos (holding back the tears, best I could) that they have NO idea how much the afternoon meant to Elsa and me. We cannot wait to come back. Christmas is a time of preparation and celebration and so much more. For us this holiday season, The Nora Project has been both a joy and a tremendous gift. We are so blessed to have had this experience and are thrilled for what the future holds through this incredible program. If you think your school might be interested in adopting The Nora Project, please reach out to me! I’d be happy to put you in touch with folks who can help you explore it further. And, as always, thanks for reading, as I gush! Your friendship means the world to Elsa, me and our family!